This year our school was once again accepted into the CHILL snowboarding program. Our students travel up to Salt Lake where they meet up with other organizations involved in the program. They then head up the canyon to Brighton Mountain Resort. 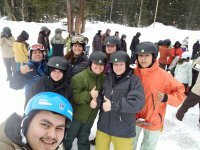 All gear is included along with snowboarding instructors for beginning snowboarders. Last week was the first week and our chill students can’t wait to get back on the mountain again this week!